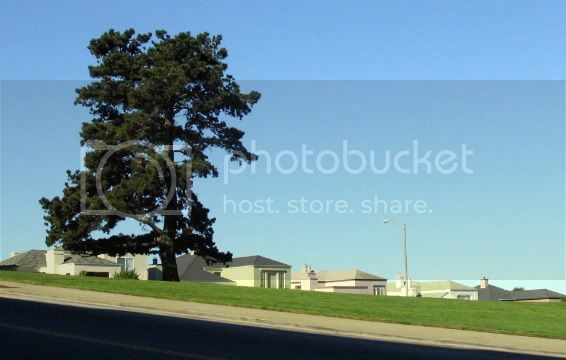 The tree looks fine, but I looked at those houses and they seemed surrealistic as if you pasted them there i.e. they look like digitallly created houses (not digitally captured ones). Probably because of the compression and reduced size of the photo. It’s funny you mention the houses. When I was taking the picture, all I saw (other than the tree, of course) was a crisp line between pavement, sidewalk, grass and sky. It wasn’t ‘til I saw it in the PC that I even noticed the houses and said to myself “OMG it’s the Edward Scissorhands neighborhood! That might be interesting by itself (maybe), but the thing is, I was walking in the heart of San Francisco. Turn in any other direction and all you’ve got are Victorian or Pseudo-Nuevo-Victorian buildings cluttered with overhead electric bus wires. But for some reason, in this particular view… there you go, an example of that bizarre, magical, ever-unexpected world we call photography.